Weekend Road Trip - NYC is #1 ~ Learn, Live, and Explore! One of my favorite things about living in Washington, D.C. is that the bright lights and big city of New York are as little as three and a half hours away - with me behind the wheel, of course! It opens the door to quench my desire for spontaneous adventure or, in this case, preplanned theater going. In general, at this point in my life I tend to appreciate NYC life in small doses, and have come to discover that around 3 days is my limit, so a weekend roundtrip, like this instance, is ideal. To ensure that every NYC trip leaves its own lasting impression, I love to try out new hotels and new neighborhoods. While midtown would have been convenient for the theaters, I opted to stay down in Tribecca. This afforded me the chance to spend the afternoon after the long drive wandering the streets, and associated boutique shops, of SoHo. While the shopping turned out to be unsuccessful, I did stumble upon something new when I did a quick trip to the Upper East Side. As I was heading up Madison Ave. to my destination, I saw a huge line on the sidewalk. Curious, and since I was only a block away from my original purpose for the trip, I asked the driver to let me off there. I discovered that the line, similar to one you may find in Georgetown for the ridiculously awful and overpriced Georgetown Cupcakes (in my opinion, as an International Connoisseur of Cupcakes, of course), was for a shop that opened at the end of August. 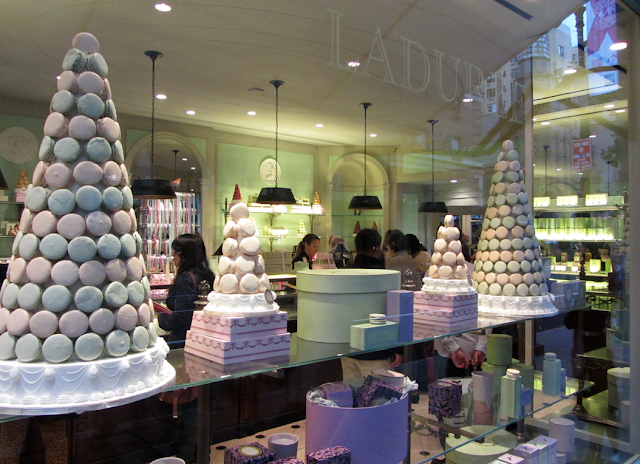 Disappointed that it wasn't a super famous celebrity, I was still intrigued because I was told this shop was the first U.S. location for a famous Parisian bakery: Maison de Ladurée. Never one to deny my curiosity, especially when I have some time to spare, I got in the line, that ended up taking about an hour, just to try the specialty of the "maison" - le macaron! These are not macarooooons -- you know the gooey, chewy amazing balls of baked coconut, sugar, and condensed milk. Macarons (pronounced mah-cah-roh, with a nice gutteral french "r" in there and a silent "ns") are basically almond meringue cookie sandwiches with buttercream or jam filling. 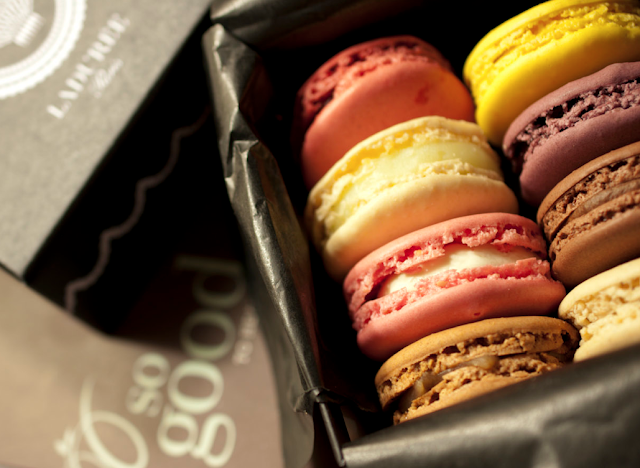 At $25 for a box of eight, I assumed that the macaron could only rival the cupcake in taste experience. Oh boy I was wrong! 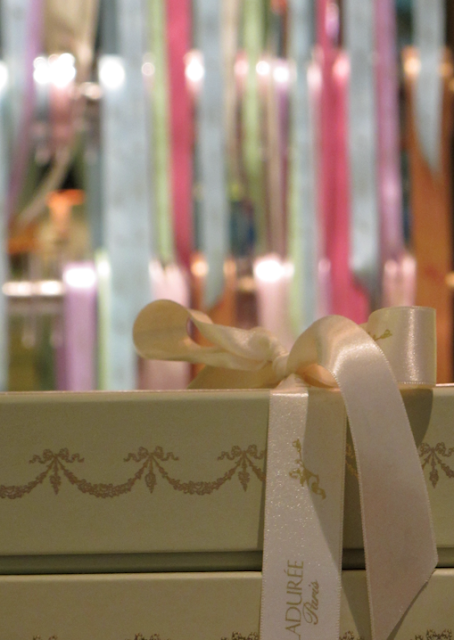 The packaging was fantastic, though, with the perfectly sized box and silk ribbon. 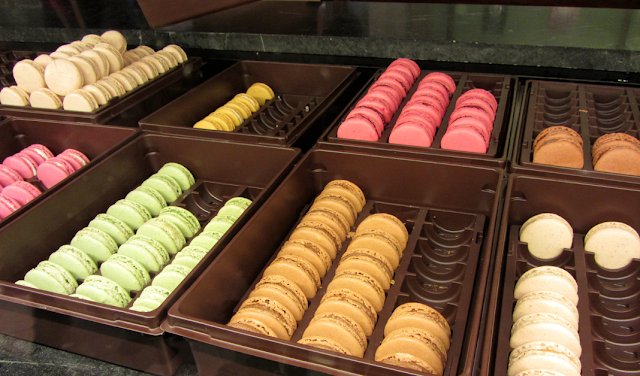 Back in my hotel room, I had my first - and last - macaron. 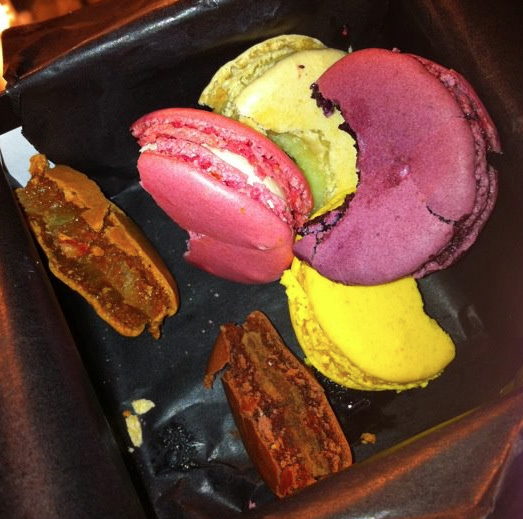 In my box, I had selected cinnamon raisin, chocolate, vanilla, black currant, raspberry, lemon, orange blossom, and rose flavored macarons. The result: In large part, I felt as if I was biting into chewy bars of soap from Bath & Body Works. As you can see, I couldn't take more than one bite of all but the vanilla one. Lesson learned! 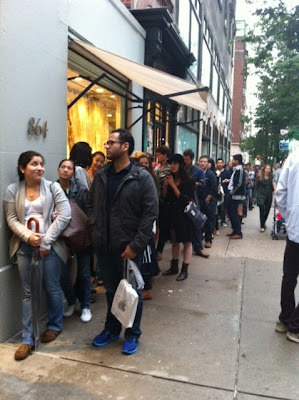 Long lines are not always worth the wait! This trip wasn't all about macarons and shopping, I also had tickets to a play and a musical. 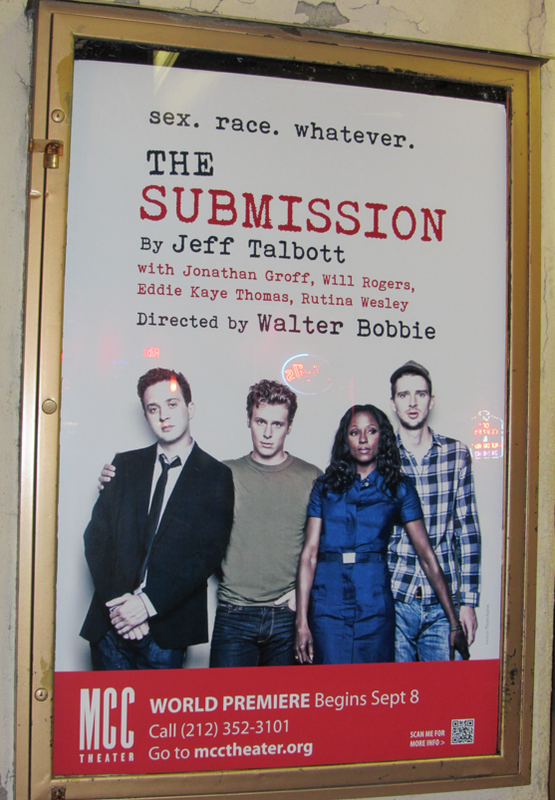 It's unfortunate that its run ends in a few weeks because The Submission - starring Jonathan Groff (Glee), Rutina Wesley (True Blood), and Eddie Kaye Thomas (American Pie) - at the Lucille Lortel Theatre on Christopher Street was a fantastic play and a must see. It explored the challenges and emotions presented when a gay playwright enters his latest play for consideration at a popular festival, but with his name changed to one that suggested he was a she and of African descent - in order to give the play, about a family in the projects, more credibility. Once selected, rather than telling the truth, he hires an actress to play the role of playwright leading up to the show's debut at the festival. The show had its funny lines, as well as the raw emotions of the two characters as they deal with constant judgment and prejudice due to their race or sexual orientation - heightened to their peak during the climactic debate over which, homosexuality or race, is perceived to be less accepted in modern society. 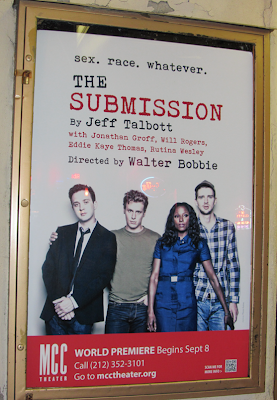 The show runs through October 22nd. To counter the serious nature of the previous night, I had the joy of experiencing the outrageous and line-toeing/crossing comedy of Trey Parker and Matt Stone, of South Park fame, at a matinee performance of the 2011 Tony Award winning musical - The Book of Mormon! My advice: DO NOT WAIT! GO SEE THIS NOW! There is nothing compared to seeing the original cast perform in such an amazing show. 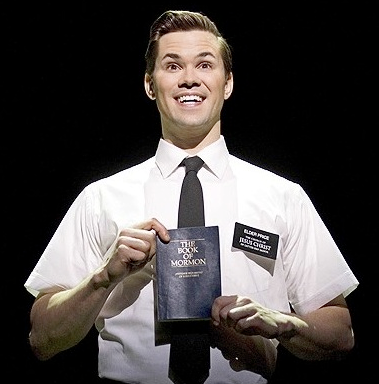 Just watch as Elder Price tries to convert a Ugandan warlord in the song "I Believe"(look it up on You Tube). Oh and come with a sense of humor! Until next time New York!! !